For days 1 and 2 at Big Island, please check this blog-post. Day 3: We decided to visit the famous Volcanoes National Park on this day. We started a little late, and arrived at the park around 11 am. Stopped at the visitor center where one of the rangers provided us information on what we could do and see the entire day. In hind-sight, the information was really useful - and we utilized the day completely. Be prepared to learn a lot! 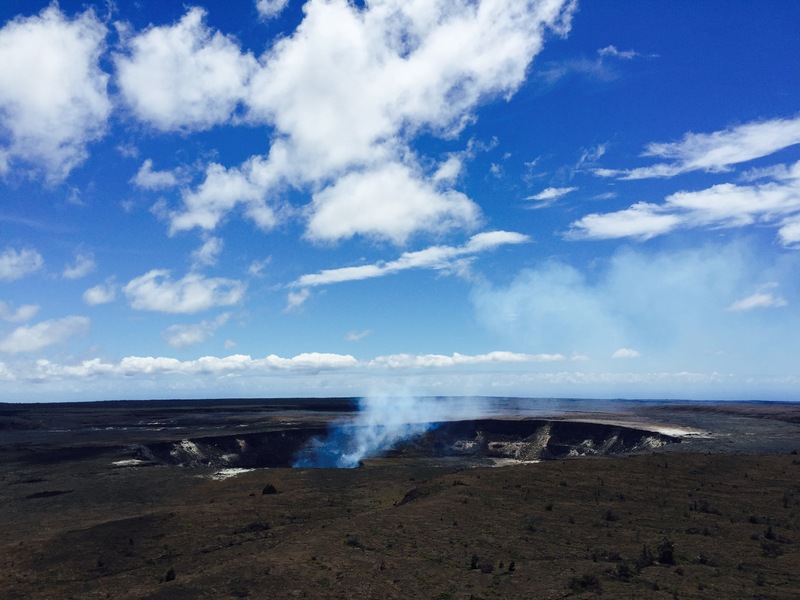 We first drove to Jaggar Museum Overlook, which offers a stunning view of the Kīlauea Caldera and since the day was sunny and clear, we also saw fumes coming out from the Halema'uma'u crater[1:1]. Seeing an active volcano for the first time is quite an experience. These fumes occurring due to magma inside the crater were visible from so far away. You would probably get burnt to death if you ventured close to the mouth of the crater. For me, this was one of the moments where mankind seems so tiny and insignificant in front of nature. We also stopped at Kīlauea Overlook which had a similar view of the crater, but no crowd at all (good for taking pictures without getting photobombed). We continued, and drove to Steam Vents next - which was steam coming from the ground. It was not warm, it was hot - and you had to step away from it after a few seconds to prevent getting scalded. I believe this steam is created as water gets in contact with the hot land and volcanic rocks underneath - so you realize that the land you're standing on is fragile, and sudden slips could cause serious accidents. We then went on a small hike to Sulphur Banks which as the name suggests, smelled of sulphur. Land and rocks there were yellow-y in color, because of their reaction with the volcanic gases that are rich in sulphur, the chemical. Some rocks were getting decomposed having been exposed to sulphur for so long. Walking down-hill: Hike through the lush green rainforest was quite fun. Reading on the signs, we learnt quite a bit about the place - feral pigs destroyed a lot of native hawaiian plantation (so they built fences to keep the pigs out of the park - this was effective, but super expensive). A lot of plants came in much later, like Kahili Ginger - but since this plant is invasive and outgrows other native plants effortlessly - they're trying to prune it out. Walking on the Caldera floor: Once we hit the bottom of the hill, we had a complete view of the caldera floor. This is walking on hardened lava. The lava here erupted in 1959 - so you're walking through history. There were steam vents at some spots, proof that the ground underneath was still active. We also saw the mouth of the crater that erupted. As we reached the end of the caldera floor and turned around, you get to see a magnificent view of the rainforests and the entire caldera - it's absolutely surreal. This moment is worth the visit. Hike up-hill: This seemed most strenuous, and we stopped to eat some food. The landscape was somewhat similar to the down-hill hike, but had more work being done (pruning etc). It didn't take much long though, the distance was shorter than the down-hill hike. After completing this hike, we headed into Thurston Lava Tube - this was right across the road when we ended our hike. This tube is interesting, it was possibly formed for lava to rush through following a volcanic eruption. You pass through rainforests to enter and exit the tube, and we also saw a Nene - the state bird of Hawaii in these rainforests, as we were leaving the place. We got back into the car, and drove on the Chain of Craters road. It's a drive down-hill - you can see the ocean, and the hardened lava as your drive down. To call it scenic, would not do enough justice. It's breath-taking, and well worth the ride. At the end of the drive, is the Sea Arch. This beautiful rock formation is right where the the land meets the ocean. 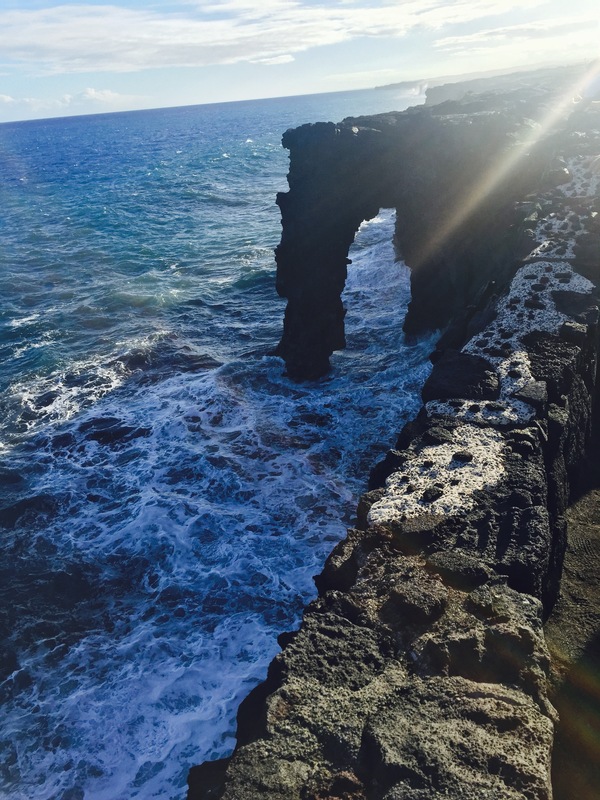 It's formed because of erosion, and as you see the waves crashing into the rocks - you realize the arch isn't going to last forever. As time passes, the waves will break it down. That's how nature works - nothing lasts forever. As we drove back up-hill during sunset - we saw the beautiful cloud cover across the park in a myriad range of colors. 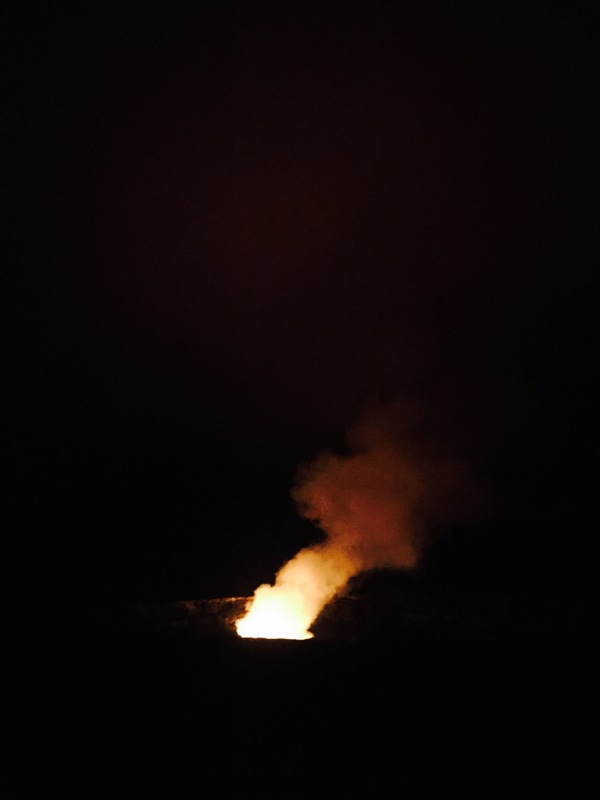 Our last stop for the day was back to Jaggar Museum Overlook to see the Halema'uma'u crater fumes in the night. It was beautiful, bright glowing orange against the dark. We also went to the museum itself, which was rich in information about volcanoes, magma, lava and craters. For dinner, we went to Volcano House. Luckily, we got a table with a view of the crater - which was cool. The food was good too, especially the sea-food.